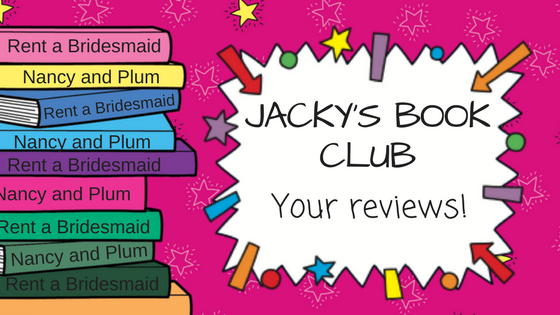 Congratulations to our first ever Star Reviewers for the Official JW Book Club! These readers entered the prize draw in issue 128 and won a copy of Rent a Bridesmaid by Jacqueline Wilson or Nancy and Plum by Betty MacDonald. They’ve read it and reviewed it to let us know what they thought! Read all about why Jacky chose these books in issue 132 of The Official Jacqueline Wilson Magazine, and see quotes from all the reviewers featured here. It’s on sale now! You can also find out how to enter the prize draw to be a Star Reviewer and have your own review featured here and in the magazine! The plot was really exciting. I couldn’t wait to read on and at the end of every chapter I tried to predict what would happen next. I felt like I really knew Tilly and I wanted good things to happen to her! I loved the way the characters were described and how they changed by the end of the story. Tilly learned that sometimes, no matter how much you want something, there are some things you can’t change in life. I felt sad for Tilly when her house was described, especially when it was contrasted with Matty’s home, which had a lovely, happy family feeling. Jacqueline Wilson used colours and words to tell us about the characters. Aunty Sue’s surname was Brown and she always wore beige which gave us a clue about what she was like as a person. I want to do that in my writing now! I really loved Tilly and Matty’s friendship. They are really different and yet the best of friends. It also made me think about families and how they come in different shapes and sizes. I realised that, as long as you are loved by people, that’s all that matters. My favourite part was that the main character was called Tilly and that’s my name too! I would give this book 5 stars and will definitely be telling my friends to read it! If you like pink and fluffy things you will like this book! There are a lot of ups and downs as we follow the main character, Tilly’s, emotions as she tries to become a bridesmaid and make her dreams come true. Tilly sets up an advert called ‘rent a bridesmaid’ and there are three very different couples who apply. I like the way the book incorporated all their different views. But when Tilly’s best friend Matty heard about the gay couple there was a negative response. The themes of the book are friendship between Tilly and her pals and also the relationships between all sorts of different adult couples and the book accepts and celebrates this. I got very carried away in the book, thinking I was there in the moment as the description of the setting was fantastic and very detailed, especially of the dresses. I really recommend it because it’s fun to read, very descriptive and, once you start reading it, you can’t put it down. I think that Rent a Bridesmaid was one of my favourite Jacqueline Wilson books and there is a lot to choose from! I loved the plot in this book about weddings, friendship and family. Also, I think this book is very touching and about doing what you please and following your dreams. I also loved that this book is about weddings, where getting married is the best thing. Tilly never gave up when she only had one letter at first, she kept on trying. The theme choice is, in my words, a little random for my usual choices but that doesn’t stop it being one of my top five most favourite books ever! My favourite character was Tilly because she is a bit like me – I love drawing like her. I also really like Miss Hope because I think she is a very supportive character – she looks out for her pupils. My favourite parts were the weddings because they made me want to be there at that moment in time and made me believe I was in the crowd watching the ceremony. This book just makes me want to be a bridesmaid! I loved all the detail about what Tilly did because I could picture everything clearly in my mind. It has reminded me I need detail in my stories! So, it’s been a big help by choosing this one! My least favourite part was when Matty and Tilly fell out when Tilly went to Matty’s house, but Lewis really made me smile when he looks after Tilly when she is upset. So, this is an AMAZING book!!!!!!! This fairy tale dream will whiz you away to a land of weddings. This lovely book is about a girl whose wish is to be a bridesmaid. Her best friend hates weddings, but this doesn’t change Matilda’s decision. When she’s given a bridesmaid dress she’s over the moon and a week later she has a wedding to go to. It really was as simple as that. She told her father and dragged him along to the wedding. Matilda has wanted this all her life. The wedding she has always, always wanted is her mum and dad’s but it just isn’t possible. She goes to several weddings of all types. She then has to stop as her bridesmaid dress gets old and she starts to grow out of it, but Matilda would never forget these beautiful moments. This book has a theme of determination and passion. It is a great, inspiring book and would encourage children to be confident and go forwards like Matilda did (maybe not by advertising to be a bridesmaid). I would recommend this book to 8-12 year olds. It is very cheery and bright with not too difficult language depending on your reading level. I think that girls would particularly enjoy this exciting novel because the main character is female and the book is quite girly in the fact that is about bridesmaids. This book has deserved a big five-star rating from me and I hope it has from others who have read this marvelous masterpiece. The plot gets 5 stars from me, because it was very interesting and it tells you what it is like being a bridesmaid. Also, it surprised me because it all started with Tilly making a new friend called Matty who interestingly is called Matilda like Tilly is! The characters also get a 5 star because they were amusing, especially Lewis because he always has something to say!!! Also, they had fall outs but made up again which was lovely. I’m giving the setting 4 stars because one of the scenes was very hard to imagine, as they were going from one place to another which got a little confusing and difficult to follow. The style gets 5 stars, because it is so detailed. Also, I loved all of the sentences because they were detailed, very interesting and funny! The theme also gets 5 stars because it tells you what it is like without a Mum. Also, it explores growing up and friendship! Nancy and Plum have been sent to live at the boarding house because their parents were killed in a train accident. Their Uncle John was supposed to look after them, but he did not know anything about children so he gave them to Mrs Monday. Mrs Monday is a horrible and mean housekeeper… she makes Nancy and Plum spend Christmas all on their own in their room, but they climb down the maple tree and go to the barn where they drink warm milk and eat hot potatoes and butter. It’s better than burnt oatmeal which is what they usually get. The sisters play imaginary games while they are eating their dinner. I think this is very clever of them. It is like Tracy Beaker! I can’t decide my favourite out of Nancy and Plum. Plum is very brave and Nancy is very kind. Their best friend is Eunice. She got an ugly doll for her Christmas present so Nancy and Plum try to make it look nice but in the end, they make her a new one and use the ugly one for a play called revenge which was about Marybelle Whistle who is Mrs Monday’s horrible niece. When she comes in, they turn it into a gardening play, but when she leaves they carry on. I thought this bit of the book was very funny and one of my favourite bits. The book is exciting and funny. It reminds me a bit of Hetty Feather, which me and my mummy are reading together at the moment, because Hetty is living away from home and Matron is also very mean. It was also a bit of a reminder of Queenie (my favourite book ever!!!!!) It also reminded me of the film Annie and Matilda by Roald Dahl. There is one kind teacher in Nancy and Plum who is a bit like Miss Honey from Matilda. The kind teacher helps Nancy and Plum make a new doll for Eunice and also helps them at the end of the book when it gets very exciting… Nancy and Plum run away! They climb down the maple tree to escape… After a lot of adventures, they are found by a nice couple called Mr and Mrs Campbell but, unfortunately, Mrs Monday tracks them down and they are taken back to the boarding house. But Mr and Mrs Campbell to the rescue! I won’t spoil it, but it’s a very happy ending!! I really enjoyed this book because it was gripping and I wanted to find out what happened next. My favourite character was Nancy, because she was kind, she thought things through and she listened to people. I noticed, that the book was set in a year. It started at Christmas and ended the next Christmas! Betty MacDonald describes it so nicely – I could imagine everything. I was surprised at how it ended! The book I read is called Nancy and Plum and the author is Betty MacDonald. The title is perfect for this book as the story is about two sisters living in a children’s home. A home that reminds me of the film Annie… (which I love as I have red curly hair!) Although, unlike the musical, I really felt like I’m right there with them – particularly during their exciting escape! My heart pounded really fast! Or have I said too much! (This was my favourite part). I could not put this book down! When I got tired my mum and dad both read to me and we laughed a lot when my dad was trying to read Miss Gronk speaking with a cold! E.g. “Dadcy and Plub” instead of Nancy and Plum. I loved the characters and their names. Marybelle was just plain, old horrible – don’t we all know someone as annoying as her! I really liked how the sisters looked after each other and are friends with the other children in the home. Also, after reading about a beautiful doll, it gave me lots of ideas on how to make and design a doll, which I’d now like to do! I really enjoyed the descriptions e.g. “leaves and little sticks slowly whirled and drifted past” – it felt like I could touch it. At times this book made me feel sad, then excited and then happy and it left me with a warm and cozy feeling. This book reminded me how lucky I am and although nothing is perfect (as that doesn’t exist) standing up for what you believe is right and being a good friend makes you amazing. I rate this book 10 out of 10! Nancy and Plum is an excellent children’s book. It is a kind of sad story because of what happens to Nancy and Plum in the children’s home, but the book explores themes like friendship and growing up. Nancy is a sweet daydreamer who is a kind friend to the other poor children in the home and is especially kind to one girl named Eunice. She is a happy friend and sings very beautifully. Plum is a tomboy and is very adventurous. She swings on and climbs trees and isn’t afraid to create a little bit of mischief here and there. She is a very good speller and a mischievous little girl. Mrs Monday and Marybelle are selfish and wicked and greedy people. Mrs Monday runs the boarding home and Marybelle is described as an ugly thing with a tendency to ruin things. Marybelle is Mrs Monday’s niece and is well-clothed and well-fed. Every night for tea, Marybelle and Mrs Monday have lovely food whilst the other boarders may as well starve because they are given oatmeal and prunes. Chicken pie is one of the delicious foods they are fed and they have waffles for breakfast sometimes. Mrs Monday locks Nancy and Plum up in the attic most of the time and they are lucky if they get one meal a day. Old Tom is Mrs Monday’s brother but, unlike his sister, he is a kind person and when Nancy and Plum get no meals, he gives them fresh, warm milk. The girls are happier at school than at home. Plum and Nancy are put in the school program and they have nice food for a picnic one day. Overall, Nancy and Plum is a lovely children’s book and I like it very, very much indeed and I could not put it down. Nancy and Plum tells the story of two girls who live in Mrs Monday’s boarding house. Nancy and Plum are very creative girls who have wild imaginations and many friends. Plum has loads of ideas, is headstrong and brave. But Nancy is quiet, calm, yet very skilful. However, Mrs Monday, who owns the boarding house, is a cruel, hateful woman who fools guardians that their children are in good care. Her niece, Marybelle, is a plump girl who is mean to everybody and gets new clothes and decent food every day. My favourite character is Plum because she is brave, adventurous and is good with animals, like me! I have noticed that Betty MacDonald has the same descriptive style and similar dialogue use as Jacqueline Wilson. Jacqueline has also taken ideas from this book, for example she uses the name of the teacher, Mrs Waverley, in “Wave me Goodbye.” She also uses the outline of the story for Hetty Feather. Another reason I love this book is because there is lots of detailed description to help me see it all so clearly in my head. It makes me feel like I am actually there in the scene. I thought that the author could have used more powerful words than “said,” for example, muttered, screeched, questioned. I recommend this book to any JW fan aged 8-11. I absolutely love this book because it is set at Christmas and mentions the reindeer Dancer, Prancer and Vixen all playing together. I love that Nancy and Plum do a Christmas play together. I think they did change by the end of the story because they were kinder at the end of the story. I can picture the setting as it says that it is Christmas Eve, and that’s a special time. I give this book 5 stars and will be telling my friends to read it too, as I really enjoyed reading it. Previous story Rent a Bridesmaid Comp Winners!